Cannot say enough about this light! We saw similar in a designer store and did not want to spend the $$$$$ to buy. Found this on Overstock and ordered it. 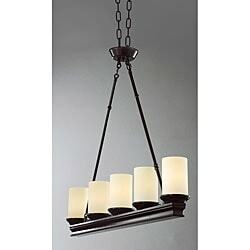 It is one of the nicest, and definitely an attention getting dining room lights we have ever had. Everyone is impressed with it and comments on it, it looks great. The quality is far better than expected. So pleased with our purchase and would recommend. Fresh and sleek, this lighting fixture features a mahogany bronze finish. The modern, cylindrical glass shades give the impression of candle light. the finish on this product is not as pictured. We were expecting a matte finish and it looked like a cheap metal. We have already replaced the fixture. We paid someone to install for us and it still looked some sort challenging to install it. Overall the light is way better than we expected. The Mahogany color matched beautifully with our dinning room. We received many compliments from friends.